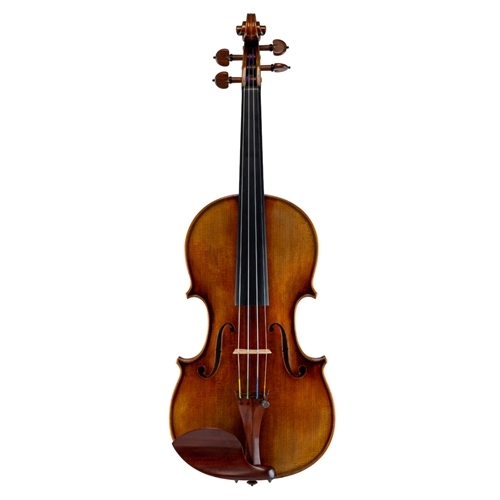 Another fine Shumanov violin, this instrument was made with the advanced player in mind. The tone is mature and complex, yet has a wonderful bell-like clarity which highlights the inner voices when playing double stops. This instrument would be perfect for a soloing or chamber music. The Guarneri pattern is well executed with precise corners and sound holes, and the tone wood for the spruce top selected for its excellent resonance. The book matched maple back and ribs are made from medium flame maple which is complemented by a red-orange varnish over an amber ground that has been lightly antiqued. Beautiful rosewood fittings with striking grain round out this wonderful violin.